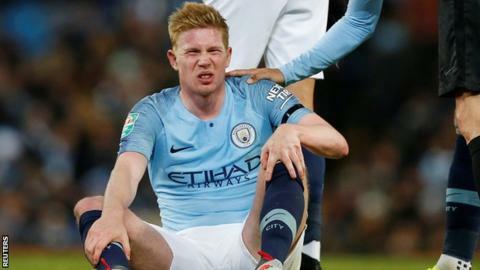 Manchester City midfielder Kevin de Bruyne will miss five to six weeks after injuring a ligament in his left knee during Thursday's 2-0 Carabao Cup victory over Fulham. The Belgium international had scans after limping off three minutes before the end of the match. The 27-year-old, who has made three appearances for City this season, will not require surgery. He previously injured a ligament in his right knee in August. The match against Fulham was only De Bruyne's second start of the season following his first injury. "We are sad for him. Nobody likes to be injured," City manager Pep Guardiola said. Premier League leaders City host Southampton at 15:00 GMT on Sunday.